Muscle spasms, sometimes called muscle cramps, occur when a muscle is injured or overused. Certain medical conditions may also cause this painful conditions. Involuntary contractions that happen in the quadriceps, calves and hamstring areas of the leg can cause nocturnal or night leg cramps. This is an extremely uncomfortable condition, that occurs for just a few minutes of time or off and on throughout the night. Abdominal cramping is another common complaint, with symptoms ranging from minor discomfort to severe pain. Causes may be benign, such as a mild stomach virus or a bad case of indigestion, among other conditions, or it could be a more serious underlying problem. If there is bloody diarrhea, jaundice or swelling, consult your healthcare provider. Painful menstrual cramps are a nuisance from some and debilitating for others. Painful menstruation is in fact, one of the top causes of lost time at work or school for females in their teens and early twenties, according to the University of Maryland Medical Center (UMMC). The pain may last for several days and many women turn to pharmacies for relief. Those who want a more natural approach have several herbal options. Wood Betony is mildly bitter and has been used in a wide range of ailments for many years. It has been used most often in the treatment of neuralgia, tension headaches, sinusitis, digestive problems, hypertension, menopausal problems, menstrual cramps, leucorrhea, anxiety, stress and the inability to relax. Betony loosely translated is "good head", and it is a clue to its traditional use. To promote well-being in the head and to ease the stress-related head strain. Wood Betony extract has a calming effect on the whole nervous system and helps you feel soothed and relaxed. It is a supportive herb in this formula. The extract of Valerian has also been used as an antispasmodic for the treatment of anxiety, sleep disorders and a diverse array of conditions associated with pain. It is believed that it increases the chemical in the brain called gamma-aminobutyric acid, or GABA, that has a calming effect on the mind and body. Valerian root is a mildly sedative herbal remedy that also reduces anxiety and restlessness and works well as a sleep aid. Valerian root extracts have also been used to treat painful stomach cramps and menstrual cramps. It has been shown to relax the spasmodic contractions of intestinal muscles and because both the uterus and the intestines are smooth muscle it may be an excellent alternative remedy for painful cramping. Blessed thistle is commonly thought of as a feminine tonic for increasing milk production in nursing mothers and has been used to treat painful menstruation and for hormone imbalance. The herb is believed to help to alleviate the symptoms of menopause, including hot flashes. Blessed Thistle extract also checks excessive bleeding. In studies, the tincture of Blessed thistle demonstrated anti-yeast activity against Candida albicans, which is responsible for causing thrush and vaginal yeast infections. The herbal extract has been helpful in relieving excess flatulence. Blessed Thistle contains a lactone that provides the bitterness that stimulates digestive secretions and the production of mucosal fluids in the intestines, which helps soothe irritated tissues. Additionally, it helps to reduce fever and inflammation and as an antibiotic and antiseptic. Traditional medicine has used Dandelion leaves and roots for centuries to help in joint conditions, kidney problems, and gallbladder disorders. American and Chinese herbalists also used Dandelion roots to treat gastrointestinal problems, breast disorders, and other inflammation-related conditions. Dandelion's main health benefits are not for menstruation, but instead, it helps to stimulate and cleanse the pancreas, liver, gallbladder, and kidneys and to ease digestion. Dandelion may also help in detoxification and to help stimulate appetite. Dandelion roots and leaves contain bitter compounds that include sesquiterpene lactones. These compounds act in the gastrointestinal tract as mild laxatives and to stimulate digestion by promoting bile production and flow in the gallbladder and liver. Some of its properties might extend themselves to the symptoms of menstruation and premenstrual syndrome. 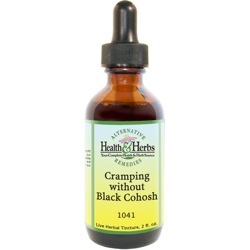 It is believed to be the go-to herb for help with heavy bleeding, a missed period, menstrual headaches and anemia. It also relieves water retention from menstruation and provides potassium, which many diuretics take away from the body. Garlic bulb is a wonderful bulb that is used for treating a wide array of common as well as, serious and life-threatening conditions, like cancer. Garlic is also a preferred and tested method for treating menstrual cramps in women. The use of Garlic bulb extract has been found to prevent or reduce the severity of menstrual pain and heavy bleeding, alleviating menstrual cramps related to menstrual problems. Garlic may act as a blood thinner because it has anti-clotting properties. To some, this may be a benefit to reduce the risk of blood clots. Anti-clotting properties help the blood stay thin and circulate with ease. Garlic also protects cells from free radicals with a natural supply of hydrogen sulfide, it protects against heart disease and other diseases. Several studies cited in the National Cancer Institute show that Garlic can help to reduce the risk of cancer, particularly, stomach, colon, esophagus, pancreas, intestinal, prostate and breast. Along with being a potent antibacterial and antiviral, Garlic is also an effective fungus fighter and is useful in suppressing yeast infections, which tend to affect people with diabetes more than others. The ancient Egyptians used it to soothe menstrual cramps and now science is catching up. Now, new research adds credence to the theory with its finding that Chamomile contains compounds that help fight infections due to colds and relieves menstrual cramps. One study found that Chamomile raised urine levels of glycine, a compound that calms muscle spasms. Higher glycine levels may relax the uterus, explaining why researchers believe Chamomile extracts help to relieve menstrual cramps. It also soothes stomach aches, eases the symptoms of irritable bowel syndrome (IBS), promotes elimination, and assists in overall digestion. The fragrant herb has been used as a sedative to calm nerves and has been touted to have anti-inflammatory properties. Chamomile extracts are most well-known for its benefits as a sleep aid. It relaxes and soothes to promote restful sleep as is relaxes both the nerves and muscles. Ingredients: Wood Betony Leaf, Sarsaparilla Root, Valerian Root, Blessed Thistle Leaf, Dandelion Leaf, Garlic Root, Chamomile Flowers, Structured Water and 20% Alcohol. Non-Alcohol: Wood Betony Leaf, Sarsaparilla Root, Valerian Root, Blessed Thistle Leaf, Dandelion Leaf, Garlic Root, Chamomile Flowers, Structured Water and Vegetable Glycerin. Instructions: Use 6 to 12 drops in water, juice, tea, under the tongue or as desired. May be taken 3 times daily. Shake well. Store in a cool, dry place. Keep out of reach of children.